Box Strapping Machine is suitable for strapping cartons of various heights very quickly without the need for bothersome strapping tools & metal seals. When you place the carton on the table & pass the strap around it, the strap self-tightens cuts & seals onto the carton automatically & is ready for the next carton. Simple Operation: Ergonomically designed control panel for easy operation. Strap at quick speed and with high efficiency. Only takes 1.5 seconds for strapping one polypropylene (PP) strap. 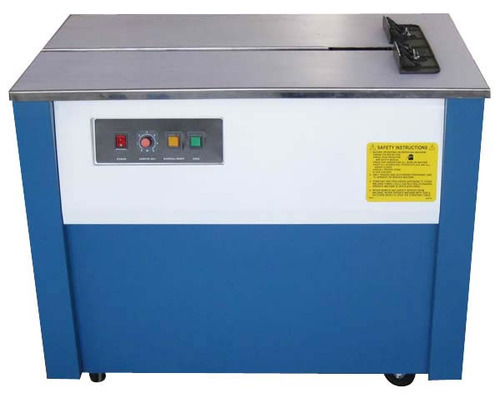 Quick Heating: Instant-heating systems, low voltage of 1 V., high safety and will be in best strapping state in 5 seconds after you start the machine. Engine: Robust and Precise Construction of engine requires easy and simple routine maintenance to ensure longer life. Energy Saving: Designed to cut off after 1 minute when not in use - prolongs motor life and is energy efficient. Wide Range of Strap Width Selection: Simple adjustable strap guide to accommodate strap width from 6 mm to 15 mm. Variable and Consistent Tension: Tension can be easily adjusted from low to high by a simple knurled nut. Electromagnetic clutch, quick and smooth. Coupled - Axle Transmission, Quick Speed, low noise, low wear and tear, hence maintenance free. Powder coated body & parts, Stainless Steel tabletop. All electrical components like timer, solenoid, micro switch etc. of best quality.